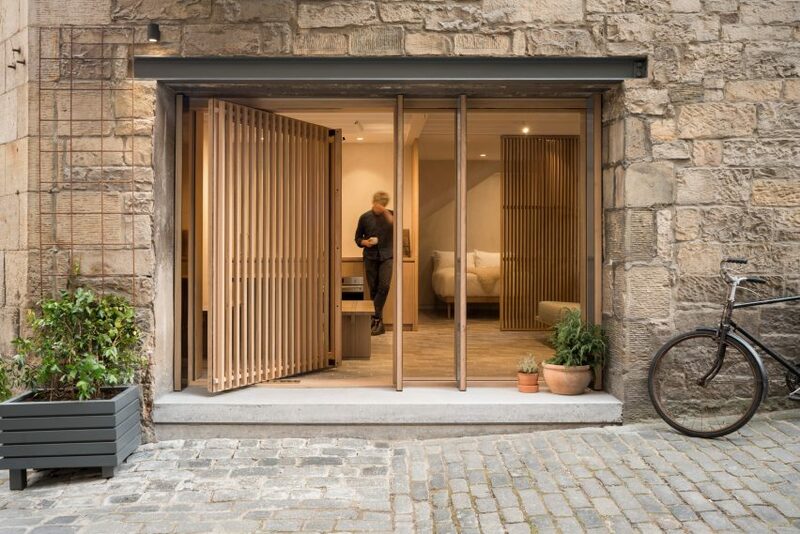 Design studio Izat Arundell has converted a former blacksmith's workshop in Edinburgh into a compact apartment, featuring a muted material palette and sliding screens that hide the bedroom from sight. 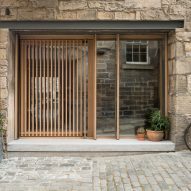 Porteous' Studio is the first project by Izat Arundell, a design practice founded by Eilidh Izat and Jack Arundell, which explores the fields of architecture, craft and food. 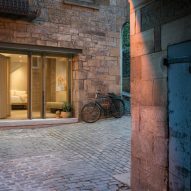 The property occupies a rare undeveloped space on one of the Old Town's historic cobbled lanes, and will be rented out as a holiday retreat for use by visitors to the Scottish capital. When Izat and Arundell purchased the site in 2016, the former 18th-century blacksmith's workshop was marketed as a garage and was being used by a stained-glass maker. 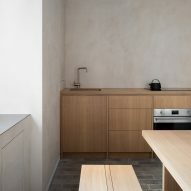 The duo decided to transform the 36-square-metre space into a studio apartment and creative venue, featuring a minimal design intended to provide visitors with a haven in the centre of the city. 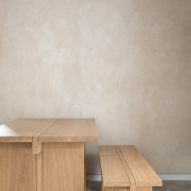 To achieve the muted and relaxing feel they wanted for the interior, the designers commissioned bespoke furniture and fittings to be made using natural materials. "The idea behind the conversion was to use pure natural products and collaborate with local makers," Arundell told Dezeen. "This idea of collaboration ran all the way through the design and build, with each maker being given room to have their own input whilst following the design aesthetics of the studio." A simple palette of stone, wood and clay helps to create a harmonious space with a crafted feel. 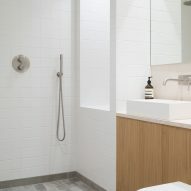 The clay-based plaster applied to the walls sets the tone, with its naturally neutral and textural quality. 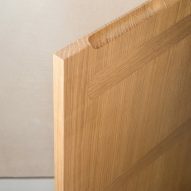 Local cabinet-maker Namon Gaston designed and produced all the furniture from a single native oak tree, which ensures consistency in tone and grain across the simple and robust pieces. 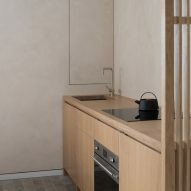 Gaston worked with Richard Anstice from kitchen specialist 56 North on crafting the bespoke kitchen and sliding screens from the same timber, while Peter Holmes contributed the upholstery. 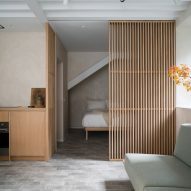 The main structural interventions included adding a cranked steel beam to support the tenement staircase above, which created a niche where the bed is now located. The original opening onto the lane was adapted by adding mullioned glazing units and a pivot door that opens the space up to the outdoors. 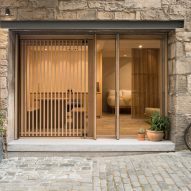 Vertical wooden battens form a screen in front of the door that retains the view out towards the historic Grassmarket. A similar sliding wooden screen is used to partition off the bedroom to the rear of the studio. A new window added on the west side of the building frames a view of a wych elm in the adjacent garden courtyard, and allows evening light to penetrate the 90-centimetre-thick stone wall. Rather than excavating the original floor slab, a layer of insulated and heated screed was added and finished with small limestone tiles chosen to echo the lane's cobbled surface. 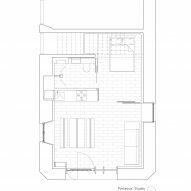 The studio's main purpose is as a holiday rental, but the owners also plan to use it to host small events and supper clubs, as a way to engage with other local designers and makers.